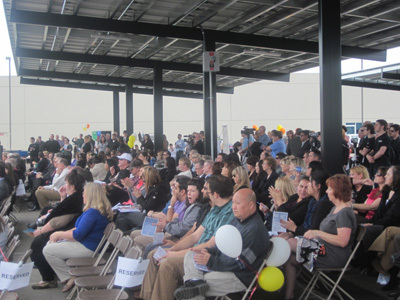 On March 29th, 2012, VIPs from around California met in Stockton at the San Joaquin County Office of Education to celebrate the completion of their 500-kilowatt photovoltaic carport project. This project is significant for a number of reasons.Â First, it represents a truly collaborative effort between the district, the business community, two non-profit organizations, and many dedicated teachers and students. 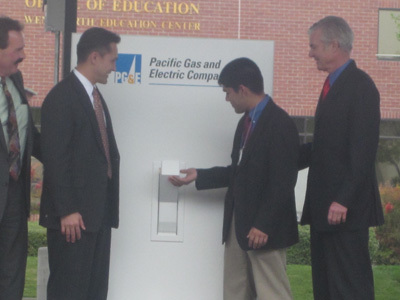 The two non-profit organizations are the National Energy Education Development (NEED) Project, and the Foundation for Environmental Education, both of which were asked by utility provider Pacific Gas and Electric to develop a comprehensive energy education program for K-12 public schools in their service area of California. 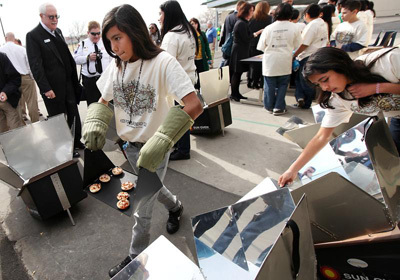 As a result, the PG&E Solar Schools program was launched in 2004 and has since provided more than 9 million dollars in support to schools in the form of teacher trainings, grants, and solar installations. 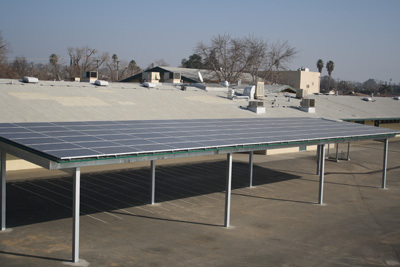 By 2008, 130 schools had been identified to receive a $25,000 grant to install 1.2 kilowatt educational “systems on a stick”, or grid tied pole mounted modules complete with Internet-based data monitoring.Â To this day, the schools are able to monitor production of their own schools and compare it to other schools throughout the state. Looking for ways to take the Solar Schools program in a new direction, the decision was made to shift from funding many small installations to identifying fewer schools to receive greater support for larger installations, and to include additional and sustained support for the schools, teachers, and students, to learn more about energy and to promote school-based energy efficiency programs such as energy audits, waste and water studies, and improvements in food service and transportation efficiency. 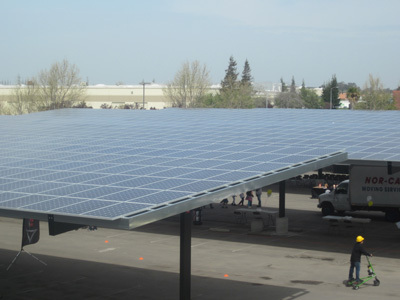 The San Joaquin County Office of Education was one three districts identified to pilot this new vision.Â Pacific Gas and Electric made the commitment to provide a $200,000 grant toward completion of a large photovoltaic system provided that it would be done in a reasonable amount of time. Efforts began in late 2010, when district leaders met to identify three potential building sites on the campus. A Request for Proposals (RFP) was developed and sent to 18 vendors.Â Five of these vendors replied with a number of solutions that included Cash Purchase, Power Purchase Agreement, and Lease Option funding proposals.Â The decision was made to build 500-kW system on the western two-acre parking lot to serve the Wentworth Education Center. 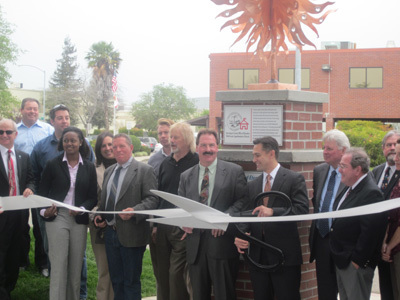 Unfortunately, before the team came to this determination they learned on December 24, 2010, that California Solar Initiative funds for non-residential projects in the PG&E service area were no longer available. Disappointed but not discouraged, they put their project on the CSI wait list in case funding might be restored. Funding was the next major decision to be made. 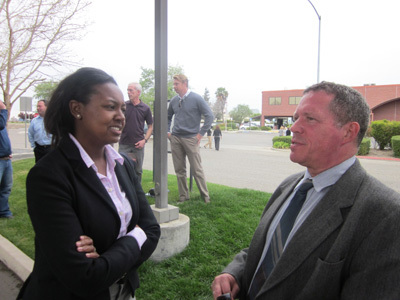 Some funding options were better than others, with a cash purchase solution being the most attractive, depending upon the interest rate.Â The county employed the expertise of GFSI in Sacramento to critically review the five finalists proposals and the benefits and dangers of each funding solution. Three of the five responding vendors were selected to provide a more detailed bid on the two-acre site, and asked to respond with a cash purchase price and to include 20 years of Operations and Maintenance, and an extended warranty on the inverters. Further, they were told to disregard CSI incentives in any Return on Investment (ROI) calculations they might include in their bids. 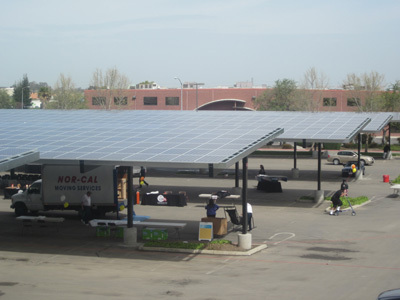 Ultimately, Solar City was the winning competitor. Not only was their price the most competitive at $5.00/watt, their experience in providing the lionâ€™s share of the 125 1kW systems was proof of their ability to perform and their educational Internet-based data page has already become the standard for the Solar Schools program. 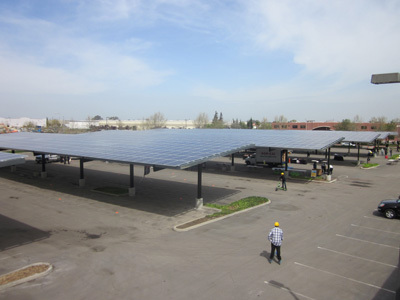 The district asked Solar City for one tiny additional component: one car-charging station At that time, San Joaquin County had no level-II electric vehicle charging stations, and we thought it would be a perfect complement. Solar City happily acceded to our request! Our final project cost would be about $2,500,000 or $5/watt. Because this project has such a profound educational component, the district decided to apply for Qualified Zone Academy Bond (QZAB) funding, the same funding that might be used to build a chemistry lab or wood shop.QZAB applications require a 10% match and the $200,000 gift from PG&E would be most of that, but leave us $50,000 shy of our needs. We went back to Solar City to ask what they might be able to do to help us meet this requirement, and after a number of conversations they agreed to add four more EV chargers for a total of five, and to include additional educational support. Energy Data Tracking: Students will be able to track, monitor, and analyze the power generated by the solar modules in real time using an Internet-based solar data-monitoring tool. The data can be analyzed by students to identify optimal performance periods and the amount of energy generated. Students will also be able to compare the data from Venture Academy with other schools throughout the State, utilizing the PG&E Solar Schools Program. In addition, the data will be incorporated into the Academyâ€™s math and science courses in regards to graphing the data and calculating the environmental impact of school energy use, and changes in consumption and production by analyzing historical data, determining cost effectiveness of the solar modules, and comparing variables such as temperature and irradiance. Energy Ambassadors: Students will participate in the development and implementation of energy efficiency and conservation efforts to reduce the schoolsâ€™ carbon footprint. 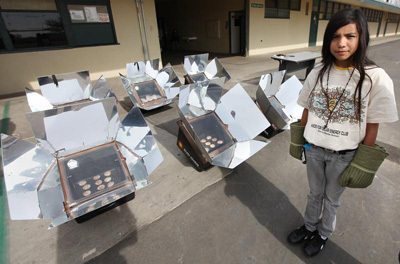 Students will provide presentations on these efforts to County schools, local businesses and organizations, and SJCOE staff, as a continuing effort to raise awareness of the importance of energy conservation. Energy Audits: Students will assess SJCOEâ€™s profile with respect to energy and water use, waste management, transportation, and other factors to develop strategies to be more efficient, sustainable, and to work towards carbon neutrality. Electric Vehicle Charging Stations: Industry partner, SolarCity, will provide five level-two charging stations in support of this project, which will be the first level-two charging stations in San Joaquin County. Students will learn how to maintain and operate the charging stations, and will learn more about the electric vehicle infrastructure. In addition, the stations will integrate with current and planned transportation projects, including building prototype alternative energy vehicles. Semi-Annual Sustainability Fairs: The laboratory will become the backdrop for sustainability and renewable energy celebrations. Academy students will host these events and staff informational booths, lead educational breakout sessions for attendees, including parents, staff, businesses, and agencies, and other key stakeholders. Construction began in January 2012 and presented an invaluable opportunity for students that hadn’t even been considered in preparing the QZAB application.Â In addition to Venture Academyâ€™s 1-kW system on a stick, the campus is home to one of five Pacific Gas and Electric Company sponsored â€œNew Energy Academiesâ€, California Partnership Academies designed to prepare students for advanced studies and careers in the energy sector. Part of the academic and career educational design of the New Energy Academy is the requirement that students spend time job-shadowing workers in the energy field.Â The construction of this large project presented the perfect opportunity for students to observe and interact with contractors, and to observe first-hand the construction process from beginning to end.Â New Energy Academy teacher Jeannine Huffman provided hard hats, safety vests, and protective eyewear to her class before making regular visits to the worksite to observe every step from boring holes for support columns to construction of the steel support structure, placement of modules, and finally the electrical connection of the system through the inverters to the distribution panels.Â Jerry Kennedy and Jonathan Gornik of Solar City were most gracious in allowing students to come over twice weekly to learn all about the different processes and skills involved in the construction project and to ask different questions of the workers there.Â A second career academy launching this fall, the Clean Transportation Technologies Academy, will also benefit by studying the generation of this solar project and the usage of the electric vehicle charging stations. All of these marvelous elements of this project, and more, were celebrated on a sunny Wednesday on March 29th.Â Special visitors included the California State Superintendent of Public Instruction, Tom Torlakson, Ezra Garrett and Leah Casey, of PG&E, Mary Spruill, Executive Director of the NEED Project, Glen Kizer of the Foundation for Environmental Education, and several elected officials and their representatives. 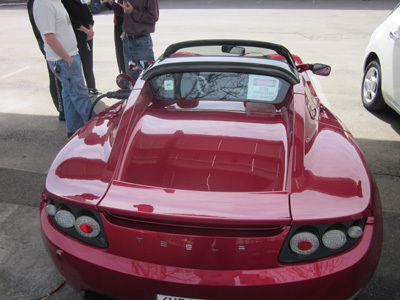 â€¨â€¨Local auto dealers brought electric vehicles, including the Nissan Leaf, a Chevrolet Volt, and an E-Mega manufactured in Stockton by Electric Vehicles International, one of the industry partners of the Clean Transportation Technologies Academy.Â â€¨â€¨There was even a Tesla Roadster brought to the dedication ceremony by a local owner.â€¨â€¨The Tesla owner was kind enough to provide rides to students and teachers, and even gave Superintendent Torlakson a ride!